For shipping questions, please feel free to call our Customer Service department at 1-800-645-5409 from 8am - 5pm CST Monday through Friday. Business days are Monday through Friday and exclude weekends and Federal Holidays. Orders must be placed before 1pm Central Standard Time M-F to ship the same business day. Next Business Day packages if ordered after 1pm CST M-F will not ship until the next business day. 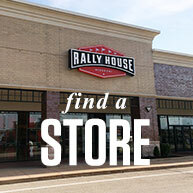 Rally House typically does not ship orders on non-business days. *All PO Box shipments will be shipped using Standard Shipping. **Special Event and Manufacturer Direct items may not qualify for any expedited shipping method. Please see the item description for more information or call 1-800-645-5409. **Free shipping offers only apply to Standard Shipping. Vendor direct shipped items or items requiring additional freight charges do not qualify for Standard Shipping or Free Shipping offers. Rally Week promos are excluded from any free shipping offer, and must ship UPS Ground. Our order fulfillment and shipping systems are designed to get orders on their way to our customers as quickly and efficiently as possible. Once an order has shipped, neither our warehouse staff nor Customer Service can change or cancel it. Select Store Pick Up and get your order the same day, subject to store availability. When you select an item available for Store Pick Up, the Store will email and/or call you as soon as your order is ready to be picked up. Orders are generally processed within 2 hours during business hours provided that all the items ordered are available at the chosen pick up location. Please note that orders with multiple items may not have all items available in the selected pick up location for same day pick up. Orders with items not available in the chosen pick up location will be ready for pick up typically within 3-5 business days. Ship your online purchase to any store and pick up your items for free! Items arrive in the store you choose typically within 5 business days, occasionally during times of extremely high demand (playoffs, championships, etc) it may take up to 10 business days. Please see individual item descriptions for any exclusions. *Shipping times are based on orders placed before 1pm CST Monday through Friday. Food items, and heavy or bulky items are not eligible for flat rate shipping. Some items require additional freight charges, which is noted on the product. Items requiring additional shipping charges will ship UPS Ground only. Shipping to PO Boxes is NOT available. Regrettably, at this time Rally House is unable to ship to APO, DPO or FPO addresses. We understand that shipping delays may happen when ordering online. We strive to get orders out as fast as possible to our customers. When they are picked up by the carrier, we are not liable for any delays that the carrier may cause. If you have any concerns about your package you can reach the Customer Service department with any concerns you may have. Any Playoff, Championship, or other Special Event and/or vendor direct items may not be available for immediate shipping. Check the item description for details. Please contact 1-800-645-5409 if you have a question regarding your order. Delivery Service options for contiguous US only. Shipping times to Alaska and Hawaii may vary. When you place an order, you will receive an Order Confirmation email. If you don't receive this email, contact Customer Service. Please note, if your order has multiple items, they may be shipped from multiple locations and arrive in different packages on different dates. There is no charge to you for extra split shipments. To track your order, click the Track My Order link at the top of your Shipping Confirmation email. Enter the tracking number and your e-mail address in the area provided.